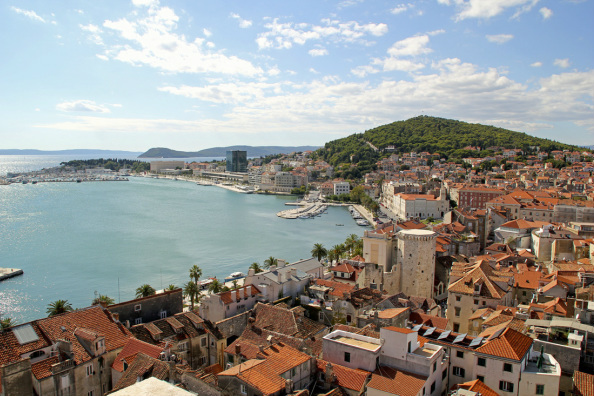 Split is a laid back costal town with loads of history buried in its windy streets and we had all day to explore. Today started with a tour of old town Split with yet another great local guide, Maja. We toured the cellars of Diocletian's palace and walked the maze of Medieval streets while she explained the town's history. Lunch on our own - we tried the recommended Olive and it was awesome! We had the afternoon to ourselves where we chose to test our fear of heights against the open air bell tower, visit the cathedral, make the walk to Meštrović's gallery and stroll back along the harbor before dinner in town. We loved starting the day with Maja, she helped us to understand the layers of history in the town in an easy to understand fashion. The bell tower views are a delight, and the metal staircase section, though breezy and open air, was less frightening than the one in Rovinj! The cathedral was a jewel, there was so much detail in such a tiny space, we had to sit down and soak it all in for a bit. The carved doors of scenes from the bible were stunning. The Meštrović gallery, was so peaceful and you could walk around the pieces to enjoy them from all angles. Pro-Tip: If a 25 minute walk seems to far for you. Catch a taxi or pedi-cab! Strolling harbor side and taking in views of the Riva on the way back from the gallery. The path was decorated with copper plaques honoring Croatia’s Olympic medal winners – it was a fun scavenger hunt to see which sports were winners and how far back the plaques went. Today I hit my peak steps for the trip - 32,030 steps thanks in part to a long walk to the Meštrović gallery and back. Peak flights of stairs for the day came climbing the bell tower to take in the beautiful views of the harbor and see the former palace from another perspective. Now, it's off to the islands as we head to Hvar and Korčula.